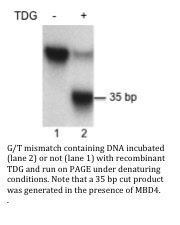 TDG is a G/T mismatch-specific thymine-DNA glycosylase (1, 2). In the DNA of higher eukaryotes, hydrolytic deamination of 5-methylcytosine to thymine leads to the formation of G/T mismatches. This enzyme corrects G/T mispairs to G/C pairs (3). It is capable of hydrolyzing the carbon-nitrogen bond between the sugar-phosphate backbone of the DNA and a mispaired thymine (3). In addition to the G/T, it can remove thymine also from C/T and T/T mispairs in the order G/T >> C/T > T/T. It has no detectable activity on apyrimidinic sites and does not catalyze the removal of thymine from A/T pairs or from single-stranded DNA. It can also remove uracil and 5-bromouracil from mispairs with guanine. 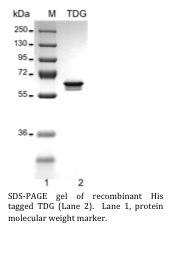 Recombinant mouse N-terminal His tagged TDG was produced in SF9 insect cells, purified using FPLC and formulated in a storage buffer containing 20mM Tris-Cl pH 7.6, 1mM EDTA, 0.15 M NaCl, 10% glycerol, 0.5mM PMSF and 1mM DTT. Protein concentration was determined by spectrometry. >95% purity by SDS-PAGE.